Earlier this summer, world traveler Dwyane Wade sat down with The Crossover to discuss his luggage line, his vacation memories, his favorite travel buddy, and more. Dwyane Wade is always on the road. The 12-time All-Star is often clinching playoff games in hostile environments or vacationing in exotic environments that would make James Bond blush. 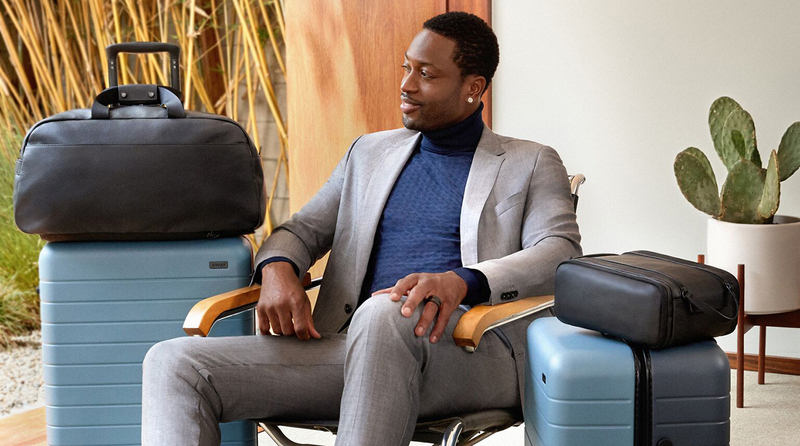 It makes sense then, that a significant part of Wade’s ever-expanding business empire includes the luggage brand Away, which is releasing its second collaboration with Wade on Sept. 25. 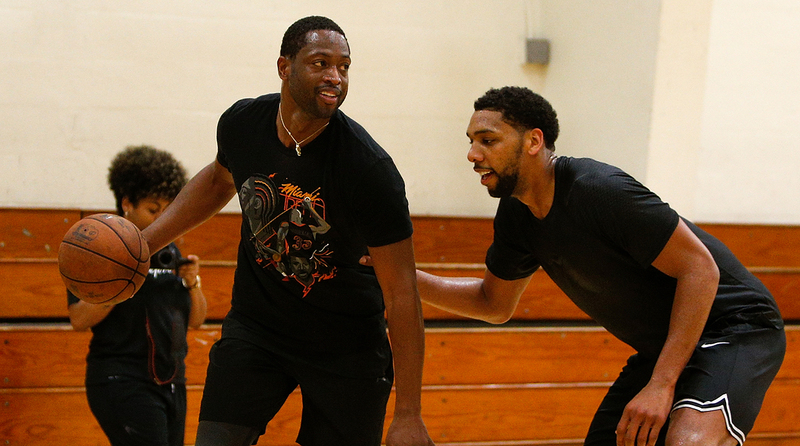 Earlier this summer, The Crossover caught up with Wade to discuss his extensive travels, a Kevin Durant conspiracy theory, and much more. Rohan Nadkarni: I want to get into all the traveling you do. Like earlier this summer you’re smoking cigars with Udonis Haslem in Ibiza. RN: Do you have a favorite place you’ve been to? What’s been the most memorable? DW: I think it varies. You go somewhere and you’re like, “I love this place!” Then you go somewhere else and you love it too. If I had to pick out of the places this summer, if we had to go back again, it would probably be the south of France. And Lake Como. You have to know your vibe. When I go out the country or travel, my vibe, first of all, is good food. And it’s just relaxation. Ibiza was cool but I’m not as much into the party vibe. I’m more, let’s relax, let’s get a message, let’s get some sun. And do boat rides and stuff like that. RN: Have you ever had a crazy experience when someone realized who you were? DW: I don’t really look at anything as crazy no more. Those days are way behind me. I kind of expect it in different places. It is cool to go to different countries and people notice you. That doesn’t mean they always come up to me, you see a lot of people pointing. Right now, the coolest thing for me, I’m 36 years old. Most of the people I’m running into, working at hotels, working at bars they grew up in my era. They have it on their phone, they can show this is me back in 2006. It’s cool because the people I run into grew up in my generation, they knew me before social media, they’ve watched me play as a young guy. I can hear the impact I’ve made on them through the game of basketball. RN: Do people ever have no clue who you are? DW: Definitely. [Laughs] I actually like those moments. I don’t like those moments when someone comes up to me and says, “I don’t know you, but let me take a picture.” I like when people say, “I’m so sorry, I don’t follow sports.” In certain instances, you want people to treat you like you aren’t a celebrity. You want to see who people are. RN: Who’s more popular when you travel—you or your wife? DW: Me overseas. I got it overseas. But in the states she’s more popular than me. RN: So, I have a conspiracy theory I want to run by you. I saw your son received some advice from Kevin Durant this summer? RN: Does that mean your beef with KD was fake? Remember a few years ago you wrote him the note and everything. Was it all actually just a Gatorade ploy? DW: [Laughs] That’s funny. To me, it wasn’t beef. RN: So you actually wrote the note? DW: I actually wrote the note. KD had this opinion on the top ten or something at the time. And that was that. We never had any beef. Me and KD’s relationship actually got better from that. When we played each other, there was no hatred or anything. I’ve had a relationship with him since. And it’s cool to see my son have a relationship with one of his favorite players in the NBA. I don’t want anything I’ve done or anything from a competitive standpoint to stop my son from being like, “Oh my god, I’m talking to KD!” These are players I love to watch. I’m fans of these players. I’m glad my son got an opportunity to sit with one of the greatest players of all-time in Kevin Durant. RN: Do you ever have conversations with your kids to kind of make sure they appreciate all the traveling? Obviously your childhood was much different. How do you handle that? But also, my kids don’t always come with us. They’re not always flying first class. When they come with us on trips they’re like, “Oh my god, this is how you guys live?” At the same time, you do want them to work for things. RN: What has it been like to go from the pressure of the Big Three era, to now having an ability to focus a little bit more on your other interests? DW: You evolve. This sport is incredible, to be able to put that kind of focus into something, it’s phenomenal. But when you’re doing that, you’re not enjoying the process. You’re enjoying the championships you’ve won, the relationships you’ve built. But the process is a blur. You’re just so focused on the day to day. To be able to look back eight years ago on what we accomplished in Miami, what we did for basketball, it’s something that is so cool. I’m okay with looking back. But I have other interests It’s that next phase, that next life. When you come into the NBA, the veteran guys tell you it will come one day. You have to mentally, physically, emotionally prepare for it. It’s a part of the journey. RN: Why is wine so popular among NBA players? DW: I don’t know. One thing, amongst me and my friends, we all started diving into wine—me, LeBron, Melo, CP—it was a great conversation piece. Whatever we were talking about, we would enjoy finer wines. When I was younger, I would see guys like Alonzo Mourning drinking wine. I would stay away from it. I didn’t really understand it. And then once I got a chance to go to Napa, I got a better appreciation. And then be able to sit down and have conversations with other adults, we’re sharing something. Wine is a great thing to share. It’s a great conversation starter for many different people in many different walks of life. RN: Who is your favorite NBA vacation buddy? DW: Probably UD. We spent the most time together. We have more to talk about, more in common. We’ve been together for 14, 15 years. We grew up together. It’s cool to see a young guy who wasn’t drafted, no one knew who he was really, to see what we’ve accomplished together. So we have a lot of things to talk about. And now we’re in this new realm as business partners. So I guess it’s UD. I’ve just really enjoyed this journey we’ve been on. RN: What’s something basketball fans don’t know about Udonis Haslem? DW: He’s funny. I can’t say they don’t know because there’s social media now, though he’s not crazy on there. But he is one of the funniest people. When people see UD they see serious. He’s a very intelligent person. And he’s f---ing funny. All I do is laugh around him. You know them older men who are funny and they have their sayings? That’s UD all day. 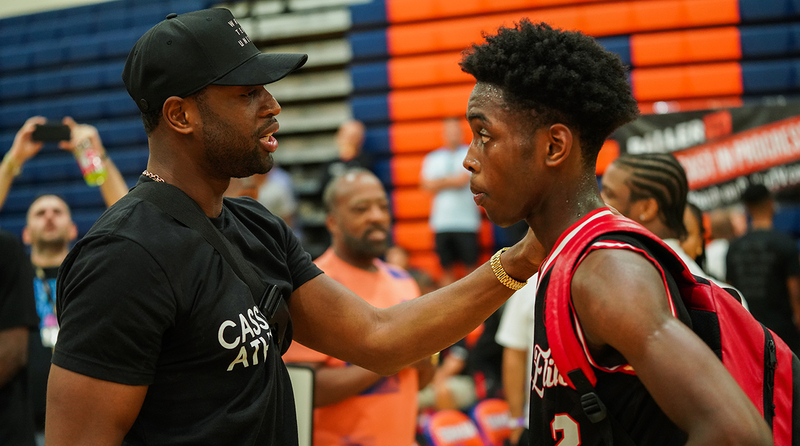 RN: How did the D-Wade Invitational happen? Do you just text a bunch of guys and ask them to come hang out? DW: Kinda sorta, yeah. This is our first year doing it. That’s what guys do during the summer. Guys train. I tried to put together what I thought was a great training environment at the Stance gym. In the summer time, if you’re not in L.A. working out at the Clippers facility, you don’t always get the full environment. A lot of guys reach out to me to ask me about business. So I wanted to put together a business feel as well. It was something I wanted to do for the last three years, hopefully we can continue. RN: What inspired you to play pickup ball with random people? DW: It’s something that just happened. I was in L.A. and I had an 8 p.m. workout, and the guys at the gym were waiting patiently for me to finish. When I wrapped up, they started playing four-on-four halfcourt. I was taking off my shoes, and one I was like, I want to get some extra cardio in, and two, I’m in this space where I’m trying to go back to when I fell in love with the game. So I go out there, guys start talking stuff. I just have fun. It’s a cool experience for me. I went home and talked to my wife about it. Even though I’m in the NBA and these guys are doctors or lawyers, we share the love of the game. RN: Last thing. People were talking about it after the Instagram comment—you and Jimmy Butler are cool, right? DW: [Laughs] Yeah, yeah, yeah. That’s my guy. The power of social media. It was just some fun banter.